Are Nigerian Soccer Fans Seeking Easy Stay in Russia? Leicester City forward Ahmed Musa scored twice to earn Nigeria all three points against Iceland in their second Group D match at the ongoing FIFA World Cup in Russia. In the 49th minute, Musa finished off a quick counter-attack in some style after controlling Victor Moses' cross and rifling home a thunderbolt. His team mate, Wilfred Ndidi unleashed a fantastic strike from the edge of the box but the goalkeeper tipped it over the bar. 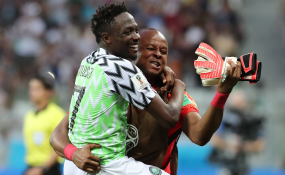 As Nigeria put the pressure on their opponents, Musa came close again in the 74th minute when he rattled the crossbar with a curling strike. However, just a minute after, he raced down the left and beat a defender for pace before cutting inside and rounding the charging goalkeeper Halldorsson before slotting home. Iceland nearly got back into the game minutes later when Tyronne Ebuehi clipped Alfred Finnbogasson in the box and the referee pointed to the spot but Gylfi Sigurdsson fired it over the bar. Nigeria now sit second behind Croatia with three points and will need only a draw against Argentina in their final Group match to get into the second round.